The historic network of hutongs in Beijing used to extend into neighbourhoods close to the Forbidden City. These are now evolving into more homogeneous areas and contact with nature is being lost. The aim of the project is to reconnect with nature and the 24 solar terms that used to structure agricultural activity in previous eras when people could define time and season by the position of the sun. By constructing an overhang with a varied system of grilles, the solar terms are reintroduced into the public realm. During the different moments of a day, the slight variations of position and incident angle of the grilles create an array of light stripes that gradually transform into an oval at midday. The shape of the oval gradually changes as the days pass. As an example, during the ‘Grain Rain’ ? the sixth solar term on 19 April ? at noon a perfect circle will occur on the wall, resembling the modern equivalent of a moon gate, connecting light to history. 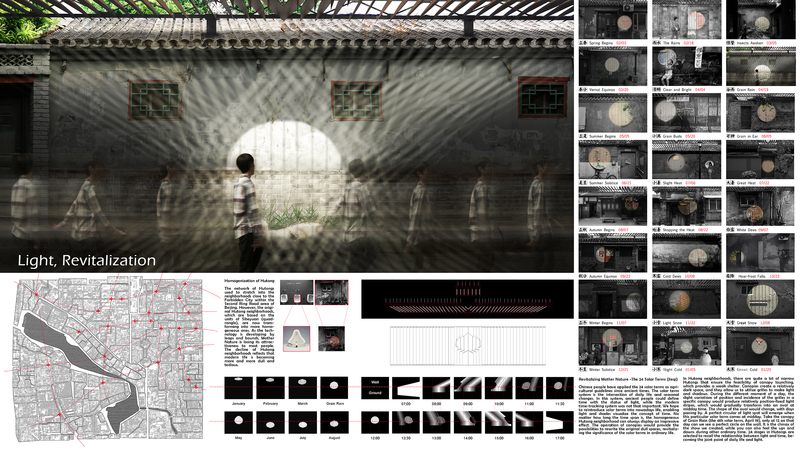 Some 24 locations in the hutongs are selected to recall the relationship between light and time, becoming gathering points of daily life and light. The first prize winner did everything the jury was looking for. The graphic communication was beautiful, the students really understood how light moves through seasons and times of day, considering how light can be captured and manipulated and even frozen at certain points and places. The students used the idea of space, time and light and connected them in a way that we have forgotten, reconnecting the passage of time and how light can be used both as a cultural signifier and cultural hub during the day. It is a very mature project. The students have managed to create something entirely plausible and feasible, tying together old Chinese traditions and new ways of looking at these traditions. The scheme demonstrates a profound understanding of the role of daylight on a city scale, on a social scale and on a cultural scale.